When observing a comet please try to forget how bright you think the comet should be, what it was when you last viewed it, what other observers think it is or what the ephemeris says it should be. The equations for the light curves of comets that are currently visible use only the raw observations and should give a reasonable prediction for the current brightness. If the comet has not yet been observed or has gone from view a correction for aperture is included, so that telescopic observers should expect the comet to be fainter than given by the equation. The correction is about 0.033 per centimetre. Values for the r parameter given in square brackets [ ] are assumed. The form of the light curve is either the standard m = H0 + 5 log d + K0 log r or the linear brightening m = H0 + 5 log d + L0 abs(t - T + D0) where T is the date of perihelion, t the present and D0 an offset, if L0 is +ve the comet brightens towards perihelion and if D0 is +ve the comet is brightest prior to perihelion. Observations of individual comets are given in ICQ format. Full text of IAU Circular announcements will not be given until the circular is publicly available. were discovered with the SOHO LASCO coronographs and have not been observed elsewhere. They were sungrazing comets of the Kreutz group and were not expected to survive perihelion. Some of these comets show no tail at all and it is possible that some supposed observations of Vulcan were actually tiny Kreutz group comets. Details of the Kreutz comets discovered or announced this year are listed here, with an abbreviated list here. 2001 A1 LINEAR M. Blythe reports the discovery by LINEAR of a new comet on January 7.47. Following posting on the NEO Confirmation Page, several other CCD observers confirmed the object's cometary nature: M. Dawson (Luxembourg) found the object to be diffuse with a 9" coma on Jan. 13.0 UT; Jan. 14.2 images taken by L. Kornos and P. Koleny (Modra) and by L. Sarounova (Ondrejov) showed coma diameters of about 15" (m_1 = 16.3) and about 20" (m_1 = 16.4), respectively; and images taken on Jan. 14.9 by J. Ticha and M. Tichy (Klet) showed a diffuse coma of diameter 17" and a faint 30" tail in p.a. 200 deg. [IAUC 7561, 2001 January 14] The comet will fade. 2001 A2 LINEAR An apparently asteroidal object discovered by LINEAR on January 15 and posted on the NEO Confirmation Page has been found to have cometary appearance on CCD images taken by P. Pravec and L. Sarounova (Ondrejov; 0'.3 coma on Jan. 16.0 UT) and by M. Tichy and M. Kocer (Klet; diffuse, 10" coma on Jan. 16.9; m_1 = 17.2). The object also links with one observed on Jan. 3.31 and 5. [IAUC 7564, 2001 January 16] The comet will reach perihelion at 0.8 AU towards the end of May. The latest orbit has 1/a (orig) of 0.001164, demonstrating that this is not the first time that the comet has visited the inner solar system. C. W. Hergenrother, M. Chamberlain, and Y. Chamberlain, Lunar and Planetary Laboratory, University of Arizona, report that 60-s R-band images of C/2001 A2 taken on Apr. 30.12 UT with the Catalina 1.54-m reflector show a double nucleus. The two components are nearly equal in brightness and 3".5 apart and aligned precisely on an east-west line. Both components are highly condensed. Observations (with the same telescope) on Apr. 24.14 show only a single nucleus. J. Broughton, Reedy Creek, Queensland, writes that his CCD observations (0.25-m f/6.6 Schmidt-Cassegrain) on May 9.3 UT showed the brighter (western) component at m2 = 14.7, with the secondary, 0.3 mag fainter, perhaps 5" distant in p.a. 100 deg, although some elongation of the secondary could make the separation as much as 7". On May 10.3 the appearance was similar. On May 11.3 the western component had brightened to m2 = 13.2, and the eastern component had virtually disappeared. On May 12.4 the western component had faded to m2 about 14.0, while the secondary was then perhaps 2 mag fainter, 8".5 away in p.a. 100 deg. Using the absolute astrometry for Apr. 30 (see IAUC 7616) and May 9 given on MPC 42656 (where the western primary is labeled B and the eastern secondary is labeled A), Z. Sekanina, Jet Propulsion Laboratory, obtained a separation time of Mar. 17 +/- 12 and an acceleration of 7.1 +/- 2.4 (in units of 10**-5 solar gravity). E. Jehin, A. Jaunsen, H. Boehnhardt, M. Kiekebusch, H. Nunez, R. Amestica, C. Herrera, J. Navarete, F. Delgado and R. M. West, European Southern Observatory, report: "Images of comet C/2001 A2 have been obtained using the 8.2-m Very Large Telescopes Melipal and Yepun with the Nasmyth and Cassegrain test cameras, respectively. On May 14.98 UT two components were seen in R-band images, the eastern, tailward one (component A) about 1 mag fainter than component B (within an aperture of 1".3) at a separation of 12".6 in p.a. 105 deg. Both components had individual comae elongated approximately in the antisolar direction. Component B showed sunward-extended isophotes in the very inner part of the coma. On May 16.98 UT the distance between the components had increased to 14".6 (in the same position angle). In addition, the sunward fragment appeared to have split into two components with a separation of 1" in p.a. 135-315 deg; these components were of about the same brightness (in R) and surrounded by a joint coma. V-band images revealed very extended isophotes perpendicular to the separation direction of this new pair. This could indicate the presence of a large amount of gas in the coma in addition to the dust." Z. Sekanina, Jet Propulsion Laboratory, writes: "Astrometric offsets of component A from B reported between Apr. 30 and May 18 (IAUC 7616, 7625, 7627, MPC 42656, MPEC 2001-K14) indicate that the splitting occurred on Mar. 29.9 +/- 1.6 UT (thus coinciding with the major outburst) and that the companion's relative deceleration is 15.2 +/- 0.7 units of 10**-5 solar attraction. Predicted separations and position angles: May 21, 19", 110 deg; 26, 28", 115 deg; 31, 39", 121 deg; June 5, 54", 128 deg; 10, 74", 136 deg; 15, 97", 145 deg; 20, 122", 156 deg. Assuming that the separation of component C (IAUC 7627) from B coincided with the outburst of May 11, the single available offset suggests that C is subjected to a deceleration of approximately 40 units of 10**-5 solar attraction. Preliminary predicted ephemeris: May 21, 3", 138 deg; 26, 8", 142 deg; 31, 16", 148 deg; June 5, 29", 154 deg." O. Schuetz, E. Jehin, X. Bonfils, H. Boehnhardt, K. Brooks, A. Delsanti, O. Hainaut, E. Jourdeuil, P. Leisy, M. Sterzik, and E. Wenderoth, European Southern Observatory (ESO); J. Helbert, DLR, Berlin; G. Garradd, Loomberah, N.S.W. ; F. Marchis, University of California at Berkeley; B. Stecklum, TLS-Tautenburg; and G. Tozzi, Osservatorio Astrofisico di Arcetri, report that an intensive high-resolution monitoring of the inner coma on June 16-21 indicates that the comet continues to fragment. The images obtained at ESO (La Silla) in the thermal infrared with the 3.6-m telescope (+ TIMMI2, N band), and in the optical region with the 3.5-m New Technology Telescope (+ EMMI, R filter) and the ESO/MPG 2.2-m telescope (+ WFI, R filter), show faint companions drifting away from the principal nucleus (B) in an approximately antisolar direction. Analysis by Z. Sekanina, Jet Propulsion Laboratory, shows that all the observations can be satisfied by three fragments, D, E, and F. The observed offsets (separation from B and position angle), the fragment identification, and the instruments used are as follows: June 16.422 UT, 2".8, 212 deg, D+E+F (TIMMI2); 17.447, 4".6, 215 deg, E+F (TIMMI2); 18.409, 6".7, 222 deg, F (WFI); 18.449, 6".5, 219 deg, F (TIMMI2); 18.456, 6".6, 222 deg, F (EMMI); 19.433, 4".7, 222 deg, D (WFI); 19.433, 7".2, 222 deg, E and/or F (WFI); 19.449, 5".0, 223 deg, D (EMMI); 19.449, 8".5, 223 deg, E and/or F (EMMI); 20.433, 6".1, 231 deg, D (WFI); 20.433, 8".3, 222 deg, E (WFI); 21.437, 11".0, 223 deg, E (TIMMI2); 21.442, 7".2, 231 deg, D (EMMI); and 21.442, 10".6, 222 deg, E (EMMI). The analysis implies that fragment D separated from B on June 3.5 +/- 1.8 with a differential nongravitational deceleration of 17 units (of 10**-5 the solar attraction) and with an initial velocity of 1.0 +/- 0.1 m/s (approximately normal to the orbit plane); fragment E on June 9.5 +/- 0.7 with a deceleration of 53 units and a velocity of 0.3 +/- 0.1 m/s; and fragment F on June 11.3 +/- 0.5 with a deceleration of 102 units and a velocity of 0.8 +/- 0.2 m/s. These breakup events apparently triggered another major outburst (cf. IAUC 7630), reported by visual observers to have peaked on June 12. David Seargent reported a visual observation at 13.1 on March 14, a little brighter than expected. It brightened very rapidly and reached 8th mag by the end of the month. It continued to brighten and became more condensed as it approached the sun. An estimate by Andrew Pearce on April 20.51 put it at 7.1 in 20x80B. Several estimates on April 24 commented that the comet had brightened rapidly in the last 24 hours and was now around 6.5. By the end of April it had reached 6th mag, but during early May the rate of brightening has slowed significantly, perhaps associated with the nuclear splitting observed at the end of April. More rapid brightening resumed around May 10 and the comet reached around 5th mag. An obsevation from Michael Mattiazzo on May 17.42 put it at 5.2 in 7x50B with a tail at least 1.6 degrees long; the comet was also visible to the naked eye. As of May 21 it was still 5th mag. Andrew Pearce reported that the comet had brightened to 4.8 on May 31.44 and the comet had a 1.5 degree long tail. The coma was noticeably blue-green in colour. On June 11.91 Andrew reported further brightening, estimating the comet at 3.6 to the naked eye and a 1.7 degree long tail in 20x80B. Michael Mattiazzo photographed the comet on June 12. Giovanni Sostero recovered the comet on June 27. I picked it up on July 1.05 with 7x50B and estimated it at 5.3. It was an easy object, well condensed and diameter 11'. On July 10.9 it was an easy object in 8x30B of about mag 5.5, DC3 and diameter 12'. A further outburst took place on July 12, and on July 12.95 it was just visible to the naked eye from central Cambridge. Michael Mattiazzo points out that the orbital plane crossing took place around July 15-16th. From this, we may expect enhancement of a dust tail in the solar and anti solar directions. 879 observations give a preliminary uncorrected light curve of 7.3 + 5 log d + 10.6 log r, with several small outbursts after the major one at the end of March, another a week or so later and a third in mid June as can be seen in the light curve. This also suggests that there was quasi- periodic variation in the light curve with an amplitude of about a magnitude. Observations in ICQ format, last observation 2001 November 16, updated 2002 August 8. 2001 B1 LINEAR M. Blythe, Lincoln Laboratory, reports the discovery by LINEAR of an apparent 17th magnitude comet on January 22.08. Additional observations have been received following posting on the NEO Confirmation Page. [IAUC 7570, 2001 January 24] The comet is in a distant parabolic orbit which reached perihelion last September and it will fade. 2001 B2 NEAT E. F. Helin, S. Pravdo, and K. Lawrence, Jet Propulsion Laboratory, report that their CCD images of this comet taken on Jan. 24.6 and 25.6 UT with the 1.2-m NEAT telescope at Haleakala show a coma diameter of about 29"; there is no convincing evidence for a tail, though some images suggest a certain asymmetry toward the northwest. Additional astrometry is reported on MPEC 2001-B47 [IAUC 7573, 2001 January 27] The comet is distant, but should brighten a little as it does not reach perihelion until June. Observations in ICQ format, last observation 2002 March 4, updated 2002 April 2. A/2001 BL41 (Spacewatch) This 20th magnitude centaur type asteroid was discovered by Spacewatch on January 19.30. It has a perihelion distance of 6.88 AU and a period of 30.7 years. It was at perihelion in February 1998. 2001 BB50 LINEAR-NEAT S. Pravdo, K. Lawrence, and E. Helin, Jet Propulsion Laboratory, reported the discovery of aN 18th mag comet on Mar. 20 CCD images taken with the NEAT 1.2-m reflector at Haleakala, the object showing a short eastward tail, a nuclear condensation of size < 3", and a coma diameter of about 10". T. B. Spahr, Minor Planet Center, linked this object first with an object reported as asteroidal by LINEAR on Mar. 18 (m_2 = 19.5) and then to the LINEAR object 2001 BB_50, observed on Jan. 21 and 26 (MPS 25734). Following posting on the NEO Confirmation Page, C. Jacques, Belo Horizonte, Brazil, also reported a 10" coma and m_1 = 18.6 on CCD images taken on Mar. 21 (0.3-m reflector). Full astrometry and the orbital elements appear on MPEC 2001-F26. [IAUC 7601, 2001 March 21] The comet has a perihelion distance of 2.35AU and is intrinsically faint. Its period is 13.6 years. 2001 C1 LINEAR L. Manguso, Lincoln Laboratory, reports the discovery of an apparent 19th mag comet by LINEAR on February 1.48. Confirming CCD observations by G. Hug (Eskridge, KS) reveal a condensed coma and a suggestion of a faint, broad tail in p.a. about 325 deg. [IAUC 7578, 2001 February 2] The preliminary orbit suggests that the comet is in a distant parabolic orbit and will not come within visual range. 2001 C5 SOHO Michael Oates discovered a 6th mag non Kreutz object on C2 images on February 14. A retrograde orbit with perihelion distance of 0.026 AU was published on MPEC 2001-D07 [2001 February 18], though Marsden notes "The above retrograde orbit solution seems more problem than a direct one." The comet could reach an elongation that would permit observation by large telescopes by the end of the month. Comet         2001 UT           R.A. (2000) Decl. Observations in ICQ format, last observation 2001 February 15, updated 2002 April 2. 2001 E1 SOHO Michael Oates discovered a faint non Kreutz object on C2 images on March 15. Studies by Maik Meyer show that it forms a triplet with 1997 L2 and 2001 X8. 2001 F1 P/NEAT E. F. Helin, S. Pravdo, and K. Lawrence, Jet Propulsion Laboratory, report the discovery of a mag 20 comet with a faint tail about 40" long toward the west-northwest on CCD images taken with the NEAT 1.2-m reflector at Haleakala on March 24.42. Additional observations, together with orbital elements (T = 2001 Jan. 21, q = 4.3 AU, i = 19 deg, P = 15.4 yr) by B. G. Marsden, are given on MPEC 2001-F51. The object appears diffuse on Mar. 28.5 UT CCD images taken by G. J. Garradd, Loomberah, N.S.W. (0.45-m f/5.4 reflector). CCD observations by M. Tichy and M. Kocer at Klet (0.57-m f/5.2 reflector) on Mar. 29.0 show a diffuse 10" coma. P. G. Comba, Prescott, AZ, reports that CCD images taken with a 0.46-m f/4.5 reflector on Mar. 29.3 show a tail in p.a. 285 deg. [IAUC 7604, 2001 March 29] The comet will fade. 2001 G1 LONEOS An apparently asteroidal 17th mag object discovered on CCD images taken with the LONEOS 0.59-m Schmidt telescope on April 1.20 and posted on the NEO Confirmation Page has been found by other astrometric observers to be cometary on their CCD images. The object was reported as being diffuse by J. Ticha, M. Tichy, and P. Jelinek at Klet (Apr. 1.9 and 2.9 UT; 9" coma on Apr. 2.9) and by C. E. Lopez and M. R. Cesco at El Leoncito (Apr. 2.2), and as having a 10" coma by M. Busch and S. Kluegl at Heppenheim, Germany (Apr. 1.9) and by J. Broughton, Reedy Creek, Queensland (Apr. 2.5). Additional astrometry and very uncertain parabolic orbital elements are given on MPEC 2001-G03. [IAUC 7606, 2001 April 2] The comet is very distant and will fade. Brain Marsden notes on MPEC 2002-G37 [2002 April 10] that the "original" and "future" barycentric values of 1/a are +0.000027 and -0.000117 (+/- 0.000009) AU**-1, respectively. This indicates that it is a new comet from the Oort cloud. 2001 H5 P/NEAT E. F. Helin, S. Pravdo, and K. Lawrence, Jet Propulsion Laboratory, report the discovery of a 17th mag comet on April 24.35, on CCD images taken with the 1.2-m Oschin Schmidt telescope at Palomar in the course of the NEAT program. CCD images taken on Apr. 25.0 UT by M. Tichy and M. Kocer at Klet (0.57-m f/5.2 reflector) show the diffuse object to have a coma diameter of 9". C. E. Lopez reports that CCD observations obtained on Apr. 25.2 at El Leoncito (0.5-m f/7.5 double astrograph) also show the object to be diffuse. Additional astrometry (including LINEAR prediscovery observations on Mar. 20 identified by B. G. Marsden) and orbital elements (T = 2001 Jan. 27.0 TT, q = 2.390 AU, i = 8.4 deg, P = 15.0 yr) are given on MPEC 2001-H37. [IAUC 7613, 2001 April 25] The comet will fade. 2001 HT50 LINEAR-NEAT S. Pravdo, E. Helin and K. Lawrence, Jet Propulsion Laboratory, report the discovery of a possible 18th mag comet by NEAT on CCD images obtained with the 1.2-m Schmidt at Palomar on May 14.22. T. B. Spahr, Minor Planet Center, has identified the object with the apparently asteroidal object 2001 HT50, observed by LINEAR on Apr. 23 and by LONEOS on Apr. 26 (MPS 30375), and has now found observations back to Mar. 3. Further details and parabolic orbital elements (T = 2003 July 8, q = 2.80 AU, Peri = 324 deg, Node = 43 deg, Incl. = 163 deg, equinox 2000.0) are given on MPEC 2001-J31. [IAUC 7624, 2001 May 14] The comet reached 11th mag at its two oppositions in 2003. Brain Marsden notes on MPEC 2003-A28 [2003 January 6] that the "original" and "future" barycentric values of 1/a are +0.000878 and +0.001234 (+/- 0.000001) AU**-1, respectively. This indicates that it is not a new comet from the Oort cloud. The comet emerged from solar conjunction in the late summer. Observations in September and October show a small diffuse coma, with the comet around 11th magnitude. By December the comet was clearly fading and was around 13th magnitude in the Northumberland refractor. Observations in ICQ format, last observation 2004 October 12, updated 2004 October 19. MPEC 2001-J34 contains 40 astrometric observations May 11-15 and parabolic orbital elements (T = 2001 Mar. 19, q = 1.00 AU, Peri. = 279 deg, Node = 198 deg, Incl. = 11 deg, equinox 2000.0) computed from 26 of them. The orbit is still very indeterminate, and it is not clear whether or not the comet is of short period. [IAUC 7625, 2001 May 15] The comet is intrinsically very faint. Brian Marsden has provided some additional information about this possibility: While I cannot exclude with 100-percent certainty the possibility that the new comet P/2001 J1 (NEAT) is the long-lost 3D/Biela, I really don't think it is. What, indeed, happened to 3D/Biela after 1852? Did it break up completely? Some 30 years ago I looked into the possibility of finding that comet again and published a number of different orbits based on different possibilities for the action of the nongravitational forces on the comet after 1852. For an epoch around 1971 these orbits all had perihelion distances under 0.83 AU and inclinations to the ecliptic under 8.1 degrees. Coming now to the recent comet, although unusually large inconsistencies among the observations made it particularly difficult to establish the orbit, and given that the comet's position in the sky makes it difficult to observe, I note that some careful observations on May 27 by Carl Hergenrother and Tim Spahr with the Vatican Advanced Technology Telescope in Arizona isolated the revolution period to 7.5-7.9 years. Tim then realized that the object had in fact been reported as unusual--though not of cometary appearance--by Arianna Gleason at Spacewatch on October 7 last year. The object was then listed on The NEO Confirmation Page for almost two weeks, although it was obviously too faint for essentially all of the likely follow-up observers, and Spacewatch itself evidently just missed the comet's position when it recorded the region again on October 19. The October 7 linkage is clearly correct, and this pins down the current period as 7.64 years. Running this orbit back gives a moderately close approach to Jupiter (0.8 AU) in 1972, before which the P/2001 J1 perihelion distance was 0.96 AU and the inclination 11 degrees. While there was tolerably good agreement in orbital eccentricity, argument of perihelion and nodal longitude, it is difficult to reconcile the perihelion distance and inclination with the 3D/Biela values. To get these elements to agree would require the nongravitational forces to act in some special way, together with the gravitational effects of occasional approaches to Jupiter. Whether or not the comets are identical, why was the current comet not observed earlier in the twentieth century? After all, the perihelion distance of under 1 AU does allow moderately close approaches to the earth--with a minimum orbital distance of perhaps 0.15 AU and an actual minimum distance of perhaps 0.5 AU in 1955. Actually, it is quite clear that at many passages through perihelion the small elongation from the sun would completely preclude observations, and by the time the object had moved around to opposition it would be as faint as when Spacewatch fortuitously observed it last October. Even under the more favorable circumstances of the 1955 perihelion passage, the best one could hope for at a 90-degree elongation from the sun would be magnitude 15, and more typically (as this year), one would have to contend with a maximum elongation of 70-80 degrees and magnitude 16 if one were lucky. We _were_ lucky that NEAT was observing this year so far from opposition, and there would have been no observing program with the capability of making the discovery at the previous comparable elongation in 1985. Unless the comet is now anomalously faint, that it escaped prior detection is fully reasonable--a situation not a bit like that of 3D/Biela on several occasions in the late eighteenth and early nineteenth centuries. 2001 K1 P/NEAT S. Pravdo, E. Helin and K. Lawrence, Jet Propulsion Laboratory, report the discovery of a 19th mag comet by NEAT on CCD images taken with the 1.2-m reflector at Haleakala on May 20.5 and 21.4 UT. M. Tichy and M. Kocer, Klet Observatory, note that the object had a 14" coma on May 21.9. P. Pravec and P. Kusnirak, Ondrejov Observatory, report a 0'.3 coma and a 0'.8 tail in p.a. 290 deg on May 21.9. T. B. Spahr, Minor Planet Center, has identified asteroidal observations of the object in LONEOS and LINEAR data back to Feb. 2. Full details are on MPEC 2001-K17. [IAUC 7629, 2001 May 21] The comet is periodic and will fade. Observations in ICQ format, last observation 2001 July 12, updated 2001 July 13. 2001 K5 LINEAR A 17th mag object reported as asteroidal by the LINEAR program on May 17.28 (with prediscovery LINEAR observations on Apr. 30 identified by G. V. Williams) and posted on The NEO Confirmation Page has been found to be slightly diffuse with coma diameter 8" on CCD images taken at Klet on May 27.0 UT by M. Tichy and J. Ticha and to be strongly condensed with a 12" coma and a 13" tail in p.a. 210 deg on 300-s R-band exposures taken with the 1.8-m f/1 Vatican Advanced Technology Telescope at Mt. Graham on May 27.3 by C. W. Hergenrother, T. B. Spahr, and M. Nelson. 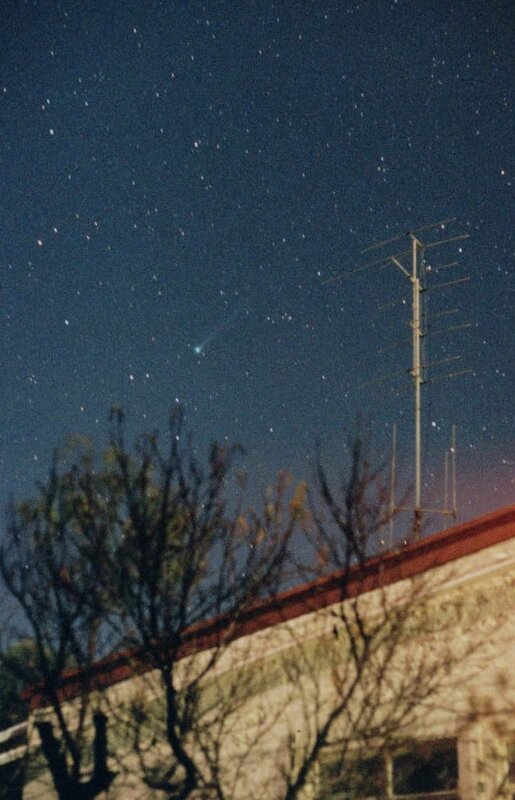 [IAUC 7634, 2001 May 28] The comet is distant and will remain at around 14th mag visually for some time. This is LINEARs 64th comet. Observations in ICQ format, last observation 2003 July 27, updated 2004 September 19. 2001 M1 P/Helin M. Busch, A. Seib, F. Hormuth, and R. Stoss, Starkenburg- Sternwarte, Heppenheim; and A. Gnadig and A. Doppler, Archenhold- Sternwarte, Berlin, report the recovery of P/1987 Q3 (= 1987w = 1987 XVII) on CCD images taken by Busch, Seib, and Hormuth with the EOCA 1.52-m reflector at Calar Alto on June 20.14 at 20th magnitude. The indicated correction to the prediction by B. G. Marsden on MPC 31664 (ephemeris on MPC 42160) is Delta(T) = -1.0 day. [IAUC 7648, 2001 June 21] The comet will brighten a little. 2001 M10 NEAT K. J. Lawrence, E. F. Helin, and S. Pravdo, Jet Propulsion Laboratory, report the discovery by NEAT of a 19th mag comet on 2001 July 20.28 with the Palomar 1.2-m Schmidt and the Haleakala 1.2-m reflector on June 29.58. [IAUC 7654, 2001 June 30] The comet is in a distant (q=5.3) orbit with a period of 138 years. 2001 MD7 P/LINEAR N. Blythe, Lincoln Laboratory Experimental Test System, reports the discovery by LINEAR of an 17th mag comet on images obtained on July 11.22, when it appeared diffuse. Subsequent observations permitted identification with the object 2001 MD_7, so designated on MPS 31852 as a result of LINEAR observations made on June 21.31 and 24. L. Sarounova reports that CCD images of the comet obtained on July 12.9 UT at Ondrejov show a bright nucleus and faint coma. [IAUC 7660, 2001 July 12] The comet could reach 13th magnitude in the autumn and it is possible that it is undergoing an outburst. This is LINEARs 65th comet. Observations in ICQ format, last observation 2002 March 12, updated 2002 April 14. 2001 N1 SOHO Discovered by Xavier Leprette, the orbit for this SOHO comet published on MPEC 2001-N24 [2001 July 11] is substantially different from the bulk of the Kreutz group members. Although the comet has a similar perihelion distance to that of the Kreutz group, the inclination, at 95 degrees, is far from the usual value of around 144 degrees. This is SOHO's 340th comet. 2001 N2 LINEAR An apparently asteroidal 18th mag object reported by LINEAR on July 11.38, which was posted on the NEO Confirmation Page, has been found to have a diffuse coma and a faint 5" tail in p.a. about 90 deg in a 3 min r-band CCD exposure taken with the 0.6-m reflector at Table Mountain by M. Hicks, D. Esqueda, and T. Ha. [IAUC 7661, 2001 July 13] The comet reaches perihelion in August 2002 and could reach 13th magnitude. Observations in ICQ format, last observation 2002 August 8, updated 2003 February 2. Regarding the announcement of this comet on IAUC 7673, the observations on July 25 were made at Haleakala, while those on July 29 were made at Palomar. Additional astrometry and very uncertain parabolic orbital elements (from 17 observations, July 25-Aug. 1) and an ephemeris appear on MPEC 2001-P01. [IAUC 7676, 2001 August 1]. The comet is a distant one, past perihelion and will fade. 2001 OG108 LONEOS Asteroid 2001 OG108, discovered by LONEOS on July 28.39 at 19th magnitude, has a high inclination cometary type orbit, though no activity has so far been detected. With a period of 51 years it doesn't reach its perihelion of 1AU until March 2002, when it may reach 14th magnitude at high northern declination. If it does show any cometary activity it may well be brighter than this. Details of the observations and orbit were given on MPEC 2001-P40 on August 13. As the clue of a cometary type orbit suggested, this object did eventually show cometary activity and is brightening rapidly. I observed it on February 9.81 and estimated it at 11.3: in the Thorrowgood refractor. On March 28.84 I was able to see it in the same instrument, despite strong moonlight and observing through trees, estimating it at 10.2. The comet is now fading and is quite a diffuse object making it difficult to locate. Large Earth-Crossing Asteroid Found A newly discovered rare asteroid may be the largest Earth-crosser known. During the past decade, astronomers have begun finding members of an unusual breed of asteroids. Called Damocloids after the first of their kind discovered, 5335 Damocles, these asteroids have elliptical orbits that resemble those of short-period comets like Comet Halley. A new member of this strange astronomical club has now been found, and its brightness suggests that it might be the largest Earth-crossing asteroid known. Provisionally titled 2001 OG108, the object was first spotted on July 28 by Michael Van Ness, an observer for the Lowell Observatory Near-Earth-Object Search (LONEOS) program in Arizona. Over the next two weeks, observers tracked the newfound asteroid to determine its path about the sun. Like other Damocloids, 2001 OG108 has an elongated orbit. Each trip about the sun takes it from beyond Uranus to just within Earth's orbital path. Because Damocloids mimic the course of short-period comets, astronomers suspect these unique asteroids might actually be "dead" comets. While the gas and ices that cause comets to flare up when they approach the sun may have been exhausted, the dark, rocky remains continue to travel through the solar system. If this notion is correct, these asteroids should have the same dark surfaces typical of short-period comet nuclei. However, 2001 OG108 is one of the brightest Earth-crossing asteroids found so far. According to LONEOS director Ted Bowell, just two other Earth-crossers rival it in brightness. But 1866 Sisyphus and 2000 WF129 orbit the sun in the inner solar system and are unlikely to be as intrinsically dark as 2001 OG108, Bowell says. If the newly discovered asteroid is darker and reflects less light than Sisyphus and 2000 WF129, but appears just as bright, it must be larger. Based on its brightness, its current distance, and an expectation of its albedo, Bowell estimates that 2001 OG108 could be as large as 10 miles (15 kilometers). The median size of the approximately 800 known Earth-crossing asteroids is less than one kilometer, so "this object really sticks out," he says. Although 2001 OG108 will occasionally zip past Earth during its 50-year journey about the sun, Bowell assures that Earthlings need not worry that the asteroid will impact Earth - at least not in the near future. In its present orbit, the Damocloid will not come any closer to us than about 28 million miles (about 45 million kilometers), or more than 100 times the distance between Earth and its moon. The astronomer points out, however, that the asteroid could potentially pass within 100 million miles of Jupiter, which may result in an orbital adjustment by the giant planet's gravitational manipulation. Currently passing through the main asteroid belt toward the inner solar system, 2001 OG108 will make its next close approach to Earth in April of next year. As it zooms past Polaris in our northern skies, the asteroid will be bright enough for amateur astronomers to spot with moderately sized telescopes. Professional astronomers will likely take interest in this rare space rock as well, in order to study its composition and attempt to confirm its once-cometary nature. 46 visual observations give a preliminary uncorrected light curve of 10.2 + 5 log d + 5.9 log r, although this is a poor fit. This suggests that the comet should have been visible to visual observers long before February. Observations in ICQ format, last observation 2002 May 15, updated 2003 February 2. 2001 P1 SOHO Discovered by Tony Scarmato, the orbit for this SOHO comet published on MPEC 2001-P22 [2001 August 8] is substantially different from the bulk of the Kreutz group members. Although the comet has a similar perihelion distance to that of the Kreutz group, the inclination, at 151 degrees, is far from the usual value of around 144 degrees and the value of L is around 208. This is SOHO's 343rd comet. 2001 P2 SOHO Discovered by Sebastian Hoenig, the orbit for this SOHO comet published on MPEC 2001-Q02 [2001 August 16] is substantially different from the bulk of the Kreutz group members. Although the comet has a similar perihelion distance to that of the Kreutz group, the inclination, at 130 degrees, is far from the usual value of around 144 degrees and the value of L is around 220 degrees. This is SOHO's 344th comet. A/2001 PT13 This is a distant asteroid, with perihelion at 8.5 AU in 1999 February, with a period of 35 years. Lawrence notes that the object is diffuse with a nuclear condensation of diameter about 3". Following posting on the NEO Confirmation Page, P. Pravec and P. Kusnirak (Ondrejov 0.65-m reflector) confirmed its cometary appearance on CCD images obtained on Aug. 18.9 UT, and M. Kocer (Klet 0.57-m reflector) reports that the object is diffuse and at m_1 = 18.0 on Aug. 18.9. T. B. Spahr, Minor Planet Center, has also identified the object in data obtained by LONEOS on July 16.2. Full astrometry and parabolic orbital elements appear on MPEC 2001-Q18. [IAUC 7685, 2001 August 18]. The comet is distant and will not get any brighter. 2001 Q2 P/Petriew Vance Avery Petriew, Regina, SK, reports his visual discovery of an 11th mag comet during a star party at Cypress Hills Interprovincial Park, Saskatchewan on August 18.42. The object's presence was also confirmed visually by R. Huziak (0.25-m reflector) and P. Campbell (0.32-m reflector) at Cyprus Hills. condensed nucleus and no tail. 0.51-m f/5 reflector at 80x. showed a coma diameter of 2'.5 and m_1 = 11.0. Additional astrometry and orbital elements by B. G. Marsden, Smithsonian Astrophysical Observatory, appear on MPEC 2001-Q31. The eccentricity is very uncertain, and the orbit indicates a close approach to Jupiter in 1982. S. Nakano, Sumoto, Japan, has also computed an elliptical orbit and notes the similarity to the orbit of comet 103P. [IAUC 7688, 2001 August 21] The ephemeris suggests that the comet should have been within visual range since July, which suggests that either the comet has recently outburst (or has a steep light curve) or that the morning sky is not being well patrolled by amateur comet hunters. In centuries past astronomers discovered new comets the old-fashioned way: they peered through telescopes or simply looked toward the sky, hunting for faint smudges that no one had seen before. It was hard work, but lots of people did it. Comets are named after their discoverers, after all, and finding a new one can mean instant fame. Hale-Bopp, Hyakutake and Shoemaker-Levy are just a few of the names we know ... because of comets. But lately it seems just about every new comet is called "LINEAR" or "NEAT." Those are names, too, but not the names of humans. They're robots -- automated, computer controlled telescopes that scan the skies in a relentless search for near-Earth asteroids and comets. This year between January and mid-August such telescopes recorded 18 new comets, while humans had found none. Comet hunters -- the human kind -- just can't compete! At least that's how many beleaguered sky watchers have been feeling. But now Canadian amateur astronomer Vance Petriew has proved humans can still discover a comet the old-fashioned way. Petriew was at the Saskatchewan Summer Star Party on August 18th when he turned his 20" telescope toward the Crab Nebula. Hopping from one star to another across the constellation Taurus, Petriew guided his telescope toward the famous supernova remnant -- but he never made it. He stopped instead at a curious smudge that appeared unexpectedly in his eyepiece. Thinking it might be a galaxy, he looked at his star charts to see if any were nearby, but there was no galaxy in the vicinity. Petriew announced his comet discovery hours later, and since then astronomers have been monitoring the newfound comet to learn more about it. Based on data spanning less that a week, it appears that Comet Petriew may be travelling around the Sun once every 5.5 years following an elliptical path that stretches from a point just inside Earth's orbit (0.95 AU) out to the realm of the giant planet Jupiter (5.3 AU). Says Brian Marsden of the Smithsonian Institution's Minor Planet Center: "We're still not completely sure of the orbital period, but Comet Petriew might have passed close to Jupiter in 1982 -- an encounter that could have nudged the comet into its current orbit." Before 1982 Comet Petriew's orbit was probably bigger than it is now. It couldn't have come so close to Earth in decades past, which might explain why it was never spotted before. The comet should reach around magnitude 10.5 and then slowly fade as it recedes from our planet, as well as from the Sun. If the comet is well-behaved, it should remain brighter than 11th magnitude through mid-September. If it behaves like comet 103P, which continued brightening for nearly two months after perihelion, it could brighten to 8th magnitude in October. The comet is a relatively easy object in the morning sky. Observing on August 27.12 with 20cm T x75 I made it 10.1, DC3 and 1.6' diameter, and in 14x100B it was 9.3, DC3 and 4.7' diameter. An observation in mid September suggested that it had changed little in brightness, however it is now fading and is likely to be fainter than 13th magnitude by the end of October. Observations in ICQ format, last observation 2001 November 17, updated 2002 June 24. 2001 Q3 SOHO This non Kreutz comet, discovered by Chen Hua Dong on SOHO imagery on August 25, may be observable from the ground. An ephemeris is given on MPEC 2001-Q60, though it will be very faint by the time it reaches a reasonable solar elongation. 2001 Q4 NEAT S. H. Pravdo, E. F. Helin, and K. J. Lawrence, Jet Propulsion Laboratory, report the discovery of a 20th mag comet on CCD images taken on August 24.40 with the 1.2-m Schmidt telescope at Palomar in the course of the NEAT program; their images on Aug. 24, 26, and 27 show a spherically symmetrical nebulosity with diameter about 8". CCD total magnitude estimates: Aug. 27.08 UT, 17.8 (J. Ticha, M. Tichy, and P. Jelinek, Klet Observatory, 0.57-m reflector); Aug. 27.47, 17.3 (P. J. Shelus, McDonald Observatory, 0.76-m reflector). [IAUC 7695, 2001 August 28] The comet was discovered when still over 10 AU from the Sun. The "original" and "future" barycentric values of 1/a are +0.000042 and -0.000703 (+/- 0.000001) AU^-1, respectively. A somewhat comparable nongravitational solution, but satisfying 956 observations with mean residual 0".78, gives A1 = +1.18 +/- 0.04, A2 = -0.13 +/- 0.04. Non- gravitational parameters A1 = +1.49 +/- 0.03, A2 = -0.2965 +/- 0.0282 from 1106 observations . The "original" value of 1/a suggests that this is a new visitor from the Oort cloud. Observations in early September 2003 put the comet at around 12th magnitude. Alexandre Amorim, observing on September 20.31 with a 0.14-m reflector x80 estimated the comet at 12.3 with a 0.5' coma. Observing with 20x80B in mid January Alexandre made the comet 8.9. By early February he was reporting it at 8th magnitude. I observed the comet from Stanley, Falkland Islands on February 19.03, where it was 40 degrees altitude and estimated it at 7.2 with a 9' coma. I flew to Rothera in the Antarctic the next day. On February 26.14 I was able to observe it in rather bright skies (sun 12 degrees below the horizon) and with a little cloud interference estimated it at 7.3 in 10x50B. On March 5.12 I had another view and made it a fraction brighter at 7.2. We then had a lengthy spell of cloudy weather, but with a forecast of clearing skies I arranged for an early morning call and made another observation on March 16.28. The comet was significantly brighter and I made it 6.9, with a 10' diameter coma. I left Rothera on March 19 and was able to make a couple more observations on the voyage to the Falkland Islands. We berthed at FIPASS just outside Stanley and from there is a short walk over a hill to dark skies. From here on March 25.00 I estimated the comet at 6.6 in 10x50B, with a 9' coma and 40' tail, and was also able to glimpse it with the naked eye at 6.0. I observed the comet from the UK on May 10.8 and found it somewhat disappointing under rather hazy skies. In 20x80B it was 4.0, with a 15' DC5 coma and hints of a 0.8 degree long tail. Between May 16 and 23 I was staying at Hohenpeissenberg in the Bavarian alps and was able to observe the comet on several occasions. My first observation on May 16.8 put it at 3.5 in 10x25 binoculars, with a 2.7 degree long tail. By May 20.8 it had faded to 4.4, with a 1.5 degree long tail. It continues to fade very slowly, and by June 12.9 was 6.1, though still with a faint 0.5 degree tail. By mid August it had faded to 8.5, but was still an easy binocular object. By mid September it required a telescope, and I estimated it at 10.2 on September 18.92 in a 30cm reflector, however other observers were estimating it a little fainter. Michael Mattiazzo gives the dates of the orbital plane crossings as 2003 April 21, 2003 Oct 24, 2004 April 20 and 2004 October 23. 1044 observations give a preliminary uncorrected light curve of 5.7 + 5 log d + 6.6 log r though it is currently about 1.5 magnitudes fainter than indicated by the mean curve. Observations in ICQ format, last observation 2005 February 5, updated 2005 March 1. 2001 Q5 P/LINEAR-NEAT K. J. Lawrence, E. F. Helin, and S. H. Pravdo, Jet Propulsion Laboratory, reported the discovery by the NEAT program of a comet, of 17th mag, having a nuclear condensation of diameter about 6" and a 100" tail toward the southwest, on CCD images taken with the 1.2-m Schmidt telescope at Palomar on Aug. 28.35. Following posting on the NEO Confirmation Page, T. B. Spahr (Minor Planet Center) identified this object with an object reported as asteroidal by the LINEAR program (first detected on Aug. 17.40 at m_2 = 18.6-19.4). Other reported physical descriptions from CCD images include: Aug. 29.04 UT, m_1 = 16.0, tail > 50" long in p.a. 237 deg (M. Tichy, Klet, 0.57-m reflector); 29.05, small coma, tail at least 4' long (L. Sarounova, Ondrejov, 0.65-m reflector); 29.08, diffuse (A. Galad and D. Kalmancok, Modra, 0.6-m reflector); 29.30, 40" tail in p.a. 243 deg (K. Smalley, Louisburg, KS, 0.75-m reflector); 29.38, well-condensed coma, broad tail 2' long in p.a. 246 deg (D. Balam, Dominion Astrophysical Observatory, 1.82-m Plaskett telescope); 29.43, m_1 = 16.9, tail about 70" long in p.a. about 240 deg (P. J. Shelus, McDonald Observatory, 0.76-m reflector). Additional astrometry and orbital elements by B. G. Marsden (from 35 observations, Aug. 17-29) appear on MPEC 2001-Q69 [IAUC 7697, 2001 August 29] The comet was at perihelion in June and will not get significantly brighter. It has a period of 6.6 years. This is LINEAR's 65th comet. Observations in ICQ format, last observation 2001 October 10, updated 2001 October 17. 2001 Q6 NEAT S. H. Pravdo, E. F. Helin, and K. J. Lawrence, Jet Propulsion Laboratory, report the discovery of another comet, of 18th mag on CCD images taken with the 1.2-m Schmidt telescope at Palomar in the course of the NEAT program; their discovery image on Aug. 28.41 shows a central nebulosity of diameter about 3" and a tail about 10" long toward the west-southwest. Other reported physical descriptions from CCD images include: Aug. 28.98 UT, diffuse (M. Tichy, Klet, 0.57-m reflector); 29.05, diffuse object (m_1 = 16.4) with a bright nucleus, m_2 = 17.9 (L. Sarounova and M. Wolf, Ondrejov, 0.65-m reflector); 29.38, coma diameter about 10" (K. Smalley, Louisburg, KS, 0.75-m reflector); 29.44, well-condensed coma, broad tail 15" long in p.a. 240 deg (D. Balam, Dominion Astrophysical Observatory, 1.82-m Plaskett telescope); 29.47, fuzzy with a hint of a bulge to the southwest (P. J. Shelus, McDonald Observatory, 0.76-m reflector). Additional astrometry and preliminary parabolic orbital elements (from 25 observations, Aug. 28-29) appear on MPEC 2001-Q70. [IAUC 7698, 2001 August 29] The comet could reach 14th mag at high northern declination in October. This is NEAT's 15th comet and 13th this year. 44 observations give a rather unlikely preliminary uncorrected light curve of 5.5 + 5 log d + 41.0 log r, although this is a poor fit. Observations in ICQ format, last observation 2002 January 13, updated 2002 October 1. 2001 Q7 SOHO A non Kreutz object of 8th magnitude discovered by R Kracht on C2 images on August 21. A/2001 QF6 (LINEAR) Discovered by LINEAR on August 16.27, this 19th mag asteroid has a 19 year period, with perihelion at 2.2 AU. It reached perihelion in February 2002, but no cometary activity was seen. It can pass within 0.3 AU of Jupiter, but has not done so recently. 2001 R1 P/LONEOS An apparently asteroidal 18th mag (red) object discovered by LONEOS on September 10.19 and posted on the NEO Confirmation Page has been found cometary. It has a period of 7.89 years and will be at perihelion on 2002 January 30. [IAUC 7713, 2001 September 11] It will brighten a little, but will not come within visual range. Observations in ICQ format, last observation 2001 October 8, updated 2001 October 17. 2001 R6 P/LINEAR-Skiff B. A. Skiff, Lowell Observatory, reports his discovery of a 17th mag comet on CCD images taken by him with the LONEOS telescope on Sept. 25.32. The object shows a moderately condensed 15" coma and a broad tail about 25" toward the west-northwest. T. B. Spahr identified this comet with an object observed on two nights (Sept. 11 and 16, previously linked; m_2 = 19.4-20.0) and reported as asteroidal in appearance by LINEAR; subsequently LINEAR observations from Aug. 19 were also identified. J. G. Ries reports that CCD images obtained with the 0.76-m reflector at McDonald Observatory on Sept. 27.3 UT also show this object to be diffuse. [IAUC 7723, 2001 September 27] The comet has a period of 8.3 years and a perihelion distance of 2.1 AU. Brian Marsden notes on MPEC 2002-S05 that the "original" and "future" barycentric values of 1/a are +0.000776 and +0.000257 (+/- 0.000003) AU**-1, respectively. [2002 September 16] The "original value of 1/a suggests that this is not a new visitor from the Oort cloud. The comet reached perihelion at 2.06 AU in January 2003 and reached 10th mag. Visual observers reported it at around 13th magnitude in early September 2002. It had brightened to around 12th magnitude by early November according to reports from Carlos Labordena and Jonathan Shanklin. Observations in January 2003 give magnitudes between 10 and 11. Observations in ICQ format, last observation 2003 June 3, updated 2004 September 19. 2001 RG100 158P/Kowal-LINEAR An asteroid discovered by LINEAR on 2001 September 12.26 was found to be a comet on CCD images taken with the Spacewatch 0.9-m reflector on 2003 November 26.4. The comet was at perihelion in late July 2002 and has a 10.3 year period with perihelion at 4.6 AU. It was put into its present orbit following an encounter to within 0.25 AU of Jupiter in 1943, prior to which perihelion was at 7.0 AU. In 2022 another encounter to 0.75 AU will pull the perihelion out to 5.7 AU. S Nakano has identified the comet with 1979 O1, observed by Charles Kowal on three occasions between July 24 and 27 and then lost. The orbit was uncertain, but noted as possibly being periodic due to the low inclination. 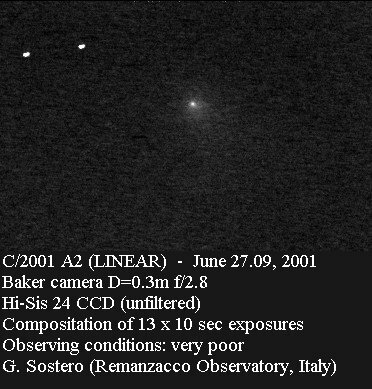 2001 S1 Skiff B. Skiff, Lowell Observatory, reports his discovery of an apparent 20th mag comet on LONEOS telescope images obtained on Sept. 26.4 UT, when the object appeared distinctly less well concentrated than nearby stars (despite poor seeing), with an apparent 17" coma. Observations by R. H. McNaught at Siding Spring on Sept. 26 show a coma barely different from the 2"-3" seeing but with a short tail (< 10" long) in p.a. about 40 deg. J. G. Ries reports that CCD images obtained with the 0.76-m reflector at McDonald Observatory on Sept. 28.4 confirm the northeastward tail of length about 10". [IAUC 7725, 2001 September 29] The comet is distant and past perihelion and will fade. A/2001 SS107 (LINEAR) An asteroid discovered by LINEAR on September 20 has a perihelion distance of 1.51 AU and a period of 5.46 years in a typical Jupiter familly comet orbit. Perihelion was on 2002 March 9.4. A/2001 SS287 (LINEAR) A 19th mag asteroid discovered by LINEAR on September 27.41 has a perihelion distance of 1.07 AU and a period of 6.13 years in a typical Jupiter familly comet orbit. Perihelion was on October 20.75. Following recovery in 2007 the orbit was refined to give perihelion distance at 1.06 AU on 2007 September 1.7 and a period of 5.85 years. It can pass 0.07 AU from the Earth and 0.1 AU from Jupiter. 2001 T1 SOHO A non Kreutz object discovered by Xavier Leprette on C2 images on October 9. 2001 T3 P/NEAT K. Lawrence, S. Pravdo, and E. F. Helin, Jet Propulsion Laboratory, report the discovery on October 14.45 by the NEAT program of an 18th mag comet with a faint coma on CCD images taken with the Palomar 1.2-m Schmidt telescope. The object also appears cometary on CCD images taken by P. Pravec and P. Kusnirak at Ondrejov (moderately condensed coma of diameter 0'.2 on Oct. 14.9 UT) and by J. Ticha, M. Tichy, and P. Jelinek at Klet (diffuse 11" coma on Oct. 14.9; 10" coma and m_1 = 17.0 on Oct. 15.8). [IAUC 7733, 2001 October 15] The comet is in a 16 year periodic orbit with perihelion at 2.5 AU. It will fade. 2001 TD45 (LINEAR) A/2001 TD45 (LINEAR) is another faint asteroid of 20th magnitude, discovered by LINEAR on October 15.40. It's 0.72 year orbit takes it to within 0.17 AU of the Sun at perihelion and out to the orbit of Mars at aphelion. 2001 TU80 LINEAR-NEAT An 18th mag object independently discovered and reported as nebulous with a 3" coma by NEAT at Palomar on Nov. 16.53 UT has been identified by G. V. Williams, Minor Planet Center, with an apparently asteroidal object reported on Oct. 13.44 and 17 by LINEAR (m_2 = 19.8; discovery observations on MPS 39482) and on Oct. 19 by NEAT at Haleakala (MPS 40840), from which an apparently routine minor-planet orbit was computed (MPEC 2001-V35). Following posting on the NEO Confirmation Page, P. Kusnirak at Ondrejov found the comet to be moderately condensed with a 0'.3 coma on CCD images taken on Nov. 17.2 with a 0.65-m f/3.6 reflector. [IAUC 7753, 2001 November 17] The comet is in a short period orbit of 7.2 years, with perihelion of 1.94 AU in mid December and will fade. The comet passed within about 0.1 AU of Jupiter in 1985, prior to which it was in a more distant, less eccentric orbit. Observations in ICQ format, last observation 2002 March 12, updated 2002 October 1. A/2001 TX16 (LINEAR) A/2001 TX16 (LINEAR) is an asteroid, of 17th magnitude, discovered by LINEAR on October 13. With a period of 6.77 years, the orbit is typical of a Jupiter family comet. There were approaches to Jupiter of 0.80 AU in 1985 and 0.73 AU in 1937. No observer has reported this object to have cometary appearance. [MPEC 2001-U45, 2001 October 25] It reaches perihelion at 1.44 AU in January, so may yet show cometary activity. 2001 U6 LINEAR An apparently asteroidal object of 19th mag discovered on Oct. 29.40 by LINEAR, posted on the NEO Confirmation Page due to its unusual motion, has been found to be cometary by J. Ticha and M. Tichy (Klet, diffuse with "a slight coma" on Nov. 3.8 UT) and by R. Trentman (Louisburg, KS, Nov. 6.3). [IAUC 7746, 2001 November 6] The comet is distant and will reach perihelion in August 2002. It will not come within visual range. Brian Marsden notes on MPEC 2002-S07 that the "original" and "future" barycentric values of 1/a are +0.000998 and +0.001075 (+/- 0.000004) AU**-1 respectively. [2002 September 16] The "original value of 1/a suggests that this is not a new visitor from the Oort cloud. 2001 W1 LINEAR A 19th mag object reported by LINEAR as apparently asteroidal but with unusual motion on November 17.43, and thus posted on the NEO Confirmation Page, has been found to appear cometary by other observers. CCD images taken by J. Nomen (Barcelona, Spain, 0.40-m f/2 Schmidt telescope) on Nov. 18.15 UT show the object to be slightly diffuse (m_1 = 18.0). CCD observations obtained by T. Spahr at the 1.2-m Mount Hopkins reflector on Nov. 18.33 show a very diffuse coma of diameter about 7" and a very faint tail about 15" long in p.a. 200 deg. [IAUC 7754, 2001 November 19]. The comet will brighten a little. A. Hale, Cloudcroft, NM, reports that this comet showed a 0'.8 coma and total visual magnitude 12.7 on Nov. 22.09 UT (0.41-m reflector). Additional astrometry and preliminary parabolic orbital elements appear on MPEC 2001-W53. [IAUC 7760, 2001 November 23] The comet reaches perihelion in late December, at 1.05 AU, but will not become much brighter than at present. The latest elements show that it is in a Halley type orbit with period 76 years. Observations in ICQ format, last observation 2001 December 20, updated 2002 September 29. 2001 WF2 P/LONEOS An object identified as asteroidal in early images has been found to show clear signs of cometary activity. The object was at perihelion in late January at 0.98 AU and has a period of 5.0 years. It is intrinsically very faint and will fade. 2001 X1 LINEAR R. Huber, Lincoln Laboratory, Massachusetts Institute of Technology, reports the discovery by LINEAR of a comet on images taken on Dec. 13.44 that show a bright core surrounded by a diffuse coma (comet's magnitude given as 16.5-17.0) and exhibiting a tail at least 95" long in p.a. 295 deg. CCD observations on Dec. 14.1 UT by R. Stoss and P. Geffert (Starkenburg Sternwarte, 0.45-m f/4.4 reflector) reveal a well- condensed coma with a thin tail 5' long in p.a. 300 deg (m_2 = 16.5). CCD images taken in twilight and poor seeing by A. C. Gilmore (Mount John, 1.0-m f/7.7 reflector) on Dec. 14.6 show the object as diffuse (m_1 = 14.6-15.1) with a broad, faint fan tail 1' long in p.a. about 315 deg. [IAUC 7774, 2001 December 14]. The comet was around 15th magnitude visually. Brian Marsden notes on MPEC 2002-F19 [2002 March 18] that the "original" and "future" barycentric values of 1/a are +0.02285 and +0.001659 (+/- 0.000042) AU**-1, respectively. These values show that the comet is not a new one from the Oort cloud. Observations in ICQ format, last observation 2002 February 11, updated 2002 October 1. 2001 X2 P/Scotti J. V. Scotti, Lunar and Planetary Laboratory, reports his discovery of a 19th mag comet on CCD images taken with the 0.9-m Spacewatch telescope on December 14.44, noting a coma diameter of 5" and a tail 0'.40 long in p.a. 283 deg (and m_2 = 22.7). Confirming observations were made at Klet by J. Ticha, M. Tichy, and P. Jelinek, who reported a 8" coma and a faint westward tail. [IAUC 7775, 2001 December 14]. The latest orbit shows that the comet is of short period (7.3 years), with perihelion at 2.5 AU in 2001 October. It will fade. 2001 X3 P/LINEAR R. Huber, Lincoln Laboratory, Massachusetts Institute of Technology, reports that a 20th mag object discovered by LINEAR on Dec. 7.08 was found to be diffuse on Dec. 17 (with prediscovery LINEAR data back to Sept. 10). G. Hug, Eskridge, KS, reports that the object is probably diffuse on CCD images taken on Dec. 19.1 UT (red mag 17.2-17.8). [IAUC 7778, 2001 December 19] The comet has a period of 6.4 years, with perihelion at 1.6 AU. It will fade. C. Hergenrother, Lunar and Planetary Laboratory; and K. Muraoka, Kochi, Japan, suggested a link between comet 11D (last seen in 1908) and P/2001 X3 (cf. IAUC 7778) -- a linkage confirmed at the Minor Planet Center and by S. Nakano (Sumoto, Japan). The orbital elements below are by Nakano (from 43 observations, 1908-2001, mean residual 0".8; nongravitational parameters A_1 = +0.13 +/- 0.01, A_2 = -0.0134 +/- 0.0007). The comet was not found in 1963 despite a prediction by B. G. Marsden (IAUC 1838, 1839, 1840). More recent predictions were made by Marsden and Sekanina (1971, A.J. 76, 1142), by Nakano (Comet Handbooks for 1989, 1995, and 1996, Oriental Astronomical Association; and NK 686), and by Muraoka (Comet Handbook for 2001, OAA). The indicated correction to Nakano's 2001 prediction (1998, NK 686) is Delta(T) = +3.4 days. [IAUC 7779, 2001 December 20] The comet was listed amongst those due to return in my predictions for 2001 in the BAA Journal for December 2000. 2001 X8 SOHO A non Kreutz comet discovered by Alexander Mimeev on December 12 in real-time C2 images. [IAUC 7797, 2002 January 19] Studies by Maik Meyer show that it forms a triplet with 1997 L2 and 2001 E1. A/2001 XQ (LINEAR) A/2001 XQ (LINEAR) is an asteroid, of 15th magnitude, discovered by LINEAR on December 6.16. It was at perihelion at 1.04 AU in mid December. [MPEC 2001-X24] With a period of 6.87 years, the orbit is typical of a Jupiter family comet. It approached to 0.53 AU of Jupiter in 1983, which made small changes to the orbit. 2001 Y1 P/Helin-Lawrence This periodic comet, first observed in 1993, has been recovered by T Oribe at the Saji observatory. It will reach perihelion at the end of 2002. 2001 YX127 P/LINEAR An object previously reported as asteroidal by LINEAR has been shown to have cometary characteristics. It is distant and faint, and will fade from 20th magnitude. It has a period of 8.5 years and a perihelion distance of 3.4 AU. Ephemerides of current comets are available on the CBAT ephemeris page and positions of newly discovered comets are on the NEO confirmation page. More information on LINEAR. List of comets discovered by selected search programs. The Northumberland refractor is the telescope that was used in the search for Neptune. It now has a 0.30-m f20 doublet lens which gives a stellar limiting magnitude of around 15 at the zenith on good nights. The Thorrowgood refractor was built in 1864 and has a 0.20-m f14 doublet lens.